It was announced today in the bulletin that Fr. John will return to his office in Trinity House on a limited schedule this coming week. Hours will vary (you can check this post on the website for updates). Earlier this week, on January 23, Father underwent a second PT scan. His results were clear, meaning no cancer has returned. He still receives adjuvant therapy three times per week as maintenance, which can unfortunately result in a range of adverse side effects. As such, he still needs your prayers. Thank you! During the Reader’s Vespers in preparation for the Nativity beginning December 19 and continuing daily through December 23, Fr. John heard Confessions off to the side. Although we will return the “new normal” after the Feast of Confessions being heard by Fr. David Smith on most Wednesdays and second and fourth Saturdays, we thank God for this important next step in Father’s healing process. Welcome Back, Fr. John! It was a joy to have Father back officiating at the Divine Liturgy today. While we are excited to have Father back serving each Sunday, we ask for your understanding and prayers this Nativity Fast as he is still unable to offer pastoral appointments of any kind. Fr. John has given parishioners who regularly confess to him a blessing to seek other priests for Confessions during this time. Fr. David Smith is available for Confessions most Wednesdays and on the second and fourth Saturdays after Great Vespers. If these times don’t work for you, please contact the church office and we will make every effort to connect you with another priest. After four weeks of intensive daily chemotherapy Fr. 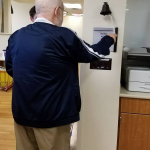 John rang the bell at the Shaner Cancer Pavilion indicating and celebrating that the most difficult part of his treatment is over. He gets the next two weeks off before beginning the in-home portion of his treatment. While it’s still too early to know when Father will be up to returning to parish life, we give glory to God for bringing him this far! Thank you so much for praying for him and his family during this difficult time. Words do not suffice to express my gratitude for all the prayers and best wishes sent my way since my recent illness, not to mention the many gifts of food brought by the house… I appreciate everyone’s understanding why I am not up for visits during this first, intensive round of chemotherapy. It is a daily infusion of interferon as adjuvant therapy to stimulate my immune system to resist any future bouts of cancer. This phase lasts for a total of four weeks… Pray now for my continued healing. A day after being surrounded by the love and prayers of his beloved brother clergy and members of his parish family, Father John received test results from his oncologist and learned his prognosis. All signs show the effectual operation of the Holy Spirit through your prayers—there is no evidence that the cancer has spread beyond his neck. This is the best possible news Father John could have received today. 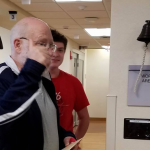 Since the cancer did not metastasize, Father John will begin a year of adjuvant (preventative) therapy using interferon to suppress the formation of any new tumors. Father gives glory to God and thanks everyone who attended the unction service and who have been praying for him. He continues to covet your prayers for strength and healing as he recovers from the neck surgery and begins chemotherapy. As communicated in prior announcements, the parish’s clergy and supply priests will maintain the liturgical schedule at both Holy Trinity and the Chapel of the Holy Spirit. Father will take this month to rest and monitor his response to treatment with the goal of serving and maintaining a limited schedule in October. [My] new ministry, as I see it, is to lead you, this parish, in the midst of my potentially life-threatening illness. While it is not one I that intended, or would have chosen, it is one that now I welcome. I welcome it because I believe that God has put this challenge before me, to be the ultimate confirmation of my calling and priesthood, to strengthen me and to strengthen you… This is where I find myself, called to confess existentially what I have professed intellectually and theologically over the years, and thereby to continue leading you to the Kingdom of God, as well. The entire parish is invited to attend the Mystery of Holy Unction for Fr. John on Wednesday, September 7 at 12:30 p.m. For those coming from work and other commitments, budget approximately 90 minutes for the service. This is an opportunity for many of us to pray alongside Father as we ask our Lord to heal Father’s body and soul. Please keep the Archpriest John in your prayers this week as he undergoes tests to determine if the melanoma was fully removed by the surgeon or if it has spread beyond his neck. For those wishing to pray at home the Akathist to St. Nektarios of Pentapolis, Patron Saint of Cancer Sufferers, a link is provided here. The same akathist will be prayed corporately after each 5:30 p.m. Wednesday Vespers for those able to stay. Diagnostic tests have been scheduled to take place Tuesday, August 30 and Wednesday, August 31 to determine if the melanoma was fully removed by the surgeon or if it has spread beyond his neck. Fr. 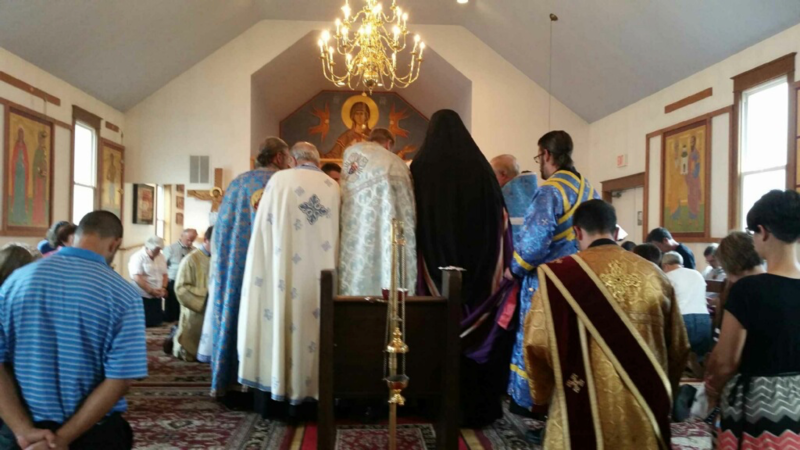 David Smith and supply clergy will celebrate the Sunday Divine Liturgy through the month of September to give Fr. John an opportunity to both heal from the surgery and begin whatever course of treatment is prescribed. Confessions will be heard at Holy Trinity on alternating Saturdays beginning today, August 27 and by appointment. Please check or subscribe to the parish’s online calendar to see the latest service schedule (updated daily). As you may of heard, Fr. John Reeves had neck surgery performed at Mount Nittany Medical Center last Friday. During the procedure a growth was discovered and removed. Diagnostic tests are still pending to determine the prognosis, but initial results have confirmed the presence of melanoma. Father and his family ask for your fervent prayers as he recovers from the surgery and awaits news of the disease’s extent and recommended course of treatment. Holy Trinity’s TLC ministry is coordinating 30 days of meals to support Father’s family as they administer care. If you would like to participate, please click here or email tlc@holytrinity-oca.org for more information. Food may be delivered to the house (a drop off area has been established in the Reeves’ garage) but please do not ring the bell so Father can rest. In the interim, pastoral emergencies will be handed by Fr. David Smith; Dn. Alexander Cadman will coordinate parish administration. Please send requests through the Parish Office (office@holytrinity-oca.org or 814-231-2855). Thank you. Father John is recovering from minor neck surgery that was performed at Mount Nittany Medical Center on Friday, August 19. While he has agreed to receive meals, he has also requested that we respect his need for time to recover as he is quite fatigued and would prefer to limit visitations at this time. If you wish to participate, please select a date and indicate the type of meal you plan to bring, so we can coordinate our efforts.